LondonJazz News: How did you first get into jazz ? Stephen Duffy: As a kid growing up in Glasgow in the '70s and '80s, there was a lot of jazz on Radio and TV, and I fell in love with it, especially as the high school I attended had some of the best school bands in the UK. I had a very traditional apprenticeship as a singer and pianist, with a gruelling series of gigs in piano bars, posh hotels and with some wonderful big bands filled with guys who had been members of the Radio Orchestra and the big name touring bands. I learned it all from the on the gig, studied briefly with my now good friend and colleague Tommy Smith, and I’m privileged to now pass that experience onto the next generation as a vocal coach. I auditioned for what is now the Royal Conservatoire of Scotland as a classical singer, but played an Oscar Peterson transcription as my piano piece and they were horrified that I could play, and chose to play, jazz! The music school showed me the door and two weeks later I auditioned for the School of Drama and got a place and subsequently a drama degree. The irony is that I’ve been a visiting lecturer in Vocal Jazz and the RCS Big Band are still using arrangements that I wrote while I was a drama student! SD: Jazz Radio was my means into the music and I listened to and learned from the legendary Radio 2 broadcasters Alan Dell, Benny Green, Sheila Tracey and above all Humphrey Lyttelton. 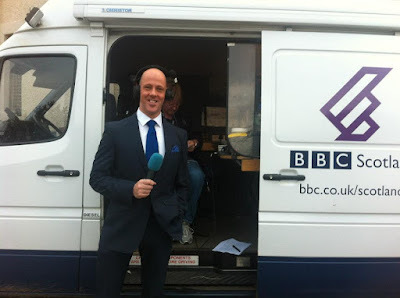 I joined the BBC Scottish Symphony Orchestra in 2000 as their PR manager, had the opportunity to present. I’ve been presenting Jazz House for a bit over 10 years, the programme was nominated for a Sony Radio Academy Award and have twice won the best media prize in the Scottish Jazz Awards. I’m enormously proud of the show’s contribution to Scottish Jazz and of the extraordinary musicians and broadcasters I’ve been so privileged to work with. LJN: What is Jazz Vaults/how long are the episodes? SD: Jazz Vaults delves into the wealth of archive interviews and features from 10 years of Jazz House. We’ve had the cream of the Scottish, UK and International jazz scene in for sessions and interviews so you’ll hear Annie Ross, Benny Golson, Brandford Marsalis, Kurt Elling, The Manhattan Transfer, Joe Locke, Lianne Carroll, Arild Andersen, to name just a few. We’ll also use some material from Radio Scotland’s Jazz Nights at the Quay which went out over the summer. LJN: How many are there going to be? SD: We put out the first of eight shows out on Sunday, featuring Annie Ross and Tommy Smith, with a feature on the life and work of my favourite arranger, Billy May. LJN: Are these all old broadcasts or is there some new stuff too? SD: My amazing producer Lee Ann Howieson sifted through the archive for the best of the material and we’re stitching in new links. LJN: What was Jazz House and how long did it run for? SD: Jazz House was a two-hour live programme featuring new and classic releases, interviews with the best in jazz, sessions from local and international guests (from the likes of Gary Burton and Curtis Stigers) and some regular features and contributors; The award-winning educator Richard Michael was a key fixture on the show, and I’ve never met anyone with his wonderful facility for communicating complex musical ideas with such clarity. Rebecca Vassmant, a former Ministry of Sound DJ, became a regular contributor too, and we got a monthly recommendation of something new and exclusive from the fabulous Jamie Cullum. SD: Tommy Smith, What can I say. No one person has provided our listeners with so many great performances and legendary guests visiting Scotland to perform with the Scottish National Jazz Orchestra. Michael Parkinson gave us two hours of the most amazing jazz chat, and there are similar intended interviews with Liane Carroll and Joe Locke that are really special. LJN: Pick a gig in Scotland in the next few months which is already beckoning you? SD: It would churlish not to mention my own performance at the opening of a new Jazz Club in Glasgow on 18 February, but the Scottish National Jazz Orchestra performing a jazz arrangement of Tchaikovsky’s Peter and the Wolf in Glasgow, Edinburgh and Aberdeen is one that will set the heather ablaze. LJN: And a Scots musician we should all know about? SD: Helena Kay – an extraordinary young tenor saxophonist from Perth who has just received the Peter Whittingham Jazz Award. She awesome.